Baboochi is a great toy. It was a lot more than I expected! I was expecting a silly cute plush but what I got was a silly cute plush well made action figure! His arms and legs have the ability to be moved and posed like a good articulated super hero figure. I was impressed. I’m really a huge fan of these book/stuffie sets and was thrilled to be given the opportunity to order this product. 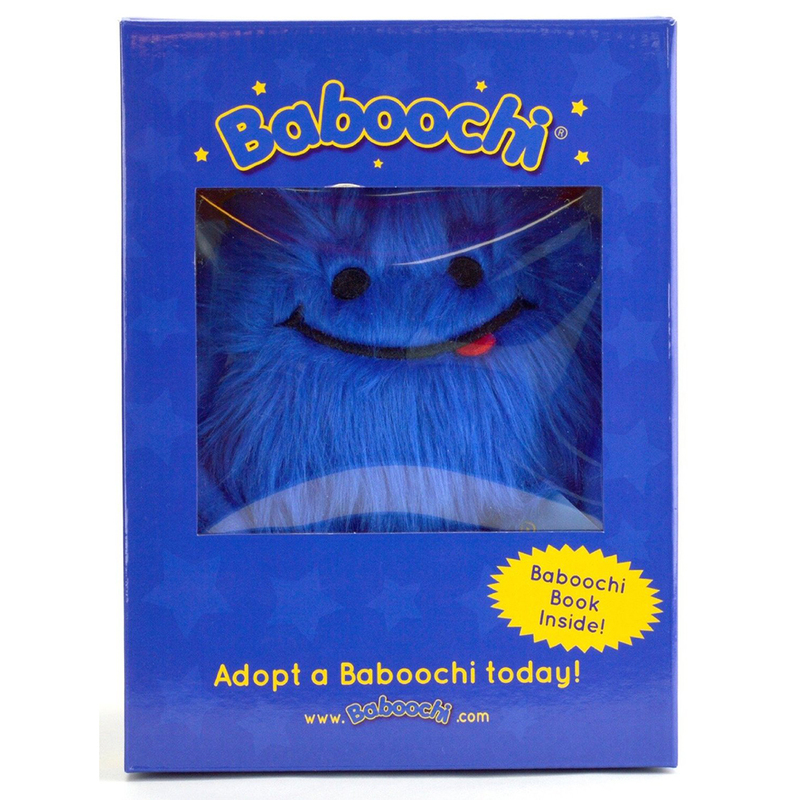 Baboochis are basically aliens from a far away, happy planet that come into your home looking for love and adoption by your child. Complete with adoption papers (this reminded me SO much of my Cabbage Patch doll and the adoption papers that came with her), Baboochi is all set and ready to become a part of your family. My son took to his Baboochi right away. He delights in listening to the story as he snuggles his new friend. Baboochi sleeps in his room at night, sits with us at the table, goes on car rides and plays in the living room. I wasn’t sure just how much my son would love this set over others we’ve bought but it’s honestly his favorite, hands down. I love the imaginative play and compassion this toy sparks in my child, and for that it’s worth every penny. Highly recommended! Baboochi is a big success with my 6 1/2 year old son. It’s been “Baboochi this” and “Baboochi that” since its arrival. He has a select few stuffed animals that live on his bed. He sleeps with them and arranges them in different ways each morning. So now Baboochi has joined the team. Baboochi has been getting a lot of hugs and my wife and I have been made to hug Baboochi a few times too. My son is really smitten with his new friend. I showed our son how Baboochi’s arms and legs are able to move and stay that way and before bed time, I found he had arranged Baboochi in a running position. 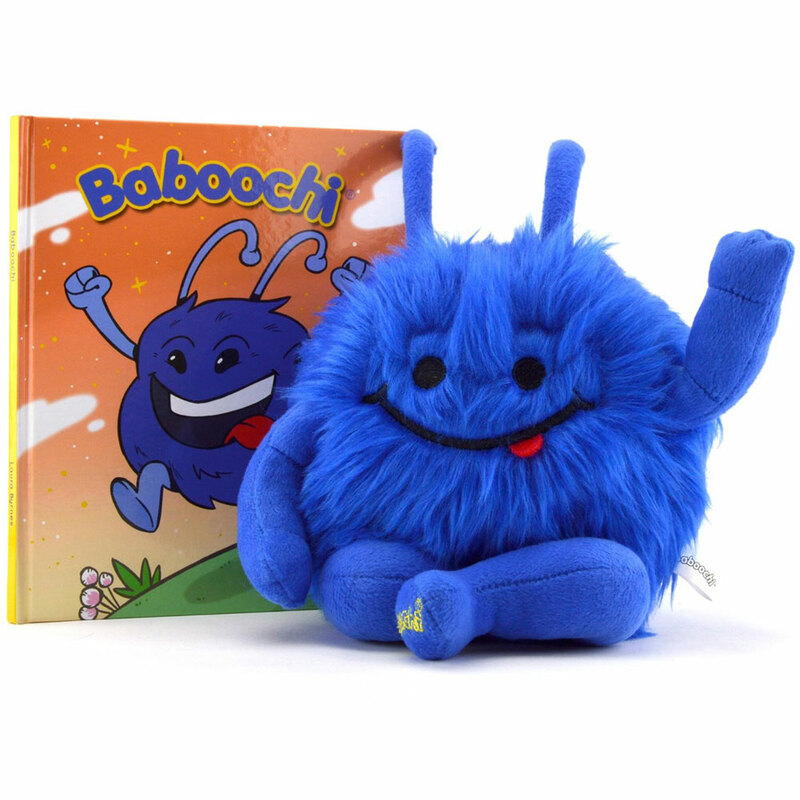 I read to my son the accompanying Baboochi book while he cuddled the stuffed animal. My son has a lot of interest in the galaxy, so he enjoyed the book. He either lies quietly and listens, when he’s enjoying a book, or he says “let’s read something else”. He lay quietly for the whole book and had a few originations about the story. At the end of the story I pointed out that he was now one of the people who has adopted a Boboochi. In my opinion; the end of the story has a great twist. I wasn’t expecting that. The whole “they’ve arrived to the planet and need to be adopted” and then the website – it’s really different and endearing. I told my son about the adoption papers but that was over his head. Needless to say, he went to sleep cuddling the stuffed animal. The next morning he was back at it and had filled in the “my name” section of the book with his name and the name he has given Baboochi, which is “Bubblegum”. I absolutely love this box set. The Baboochi is so cute. My kids really love it. The story is very cute and sweet. It’s about a poor race that are forced to flee their home and come to Earth. I like that it helps teach kids to care for those who are different and maybe not as well off. This doll is not like your typical plush doll. 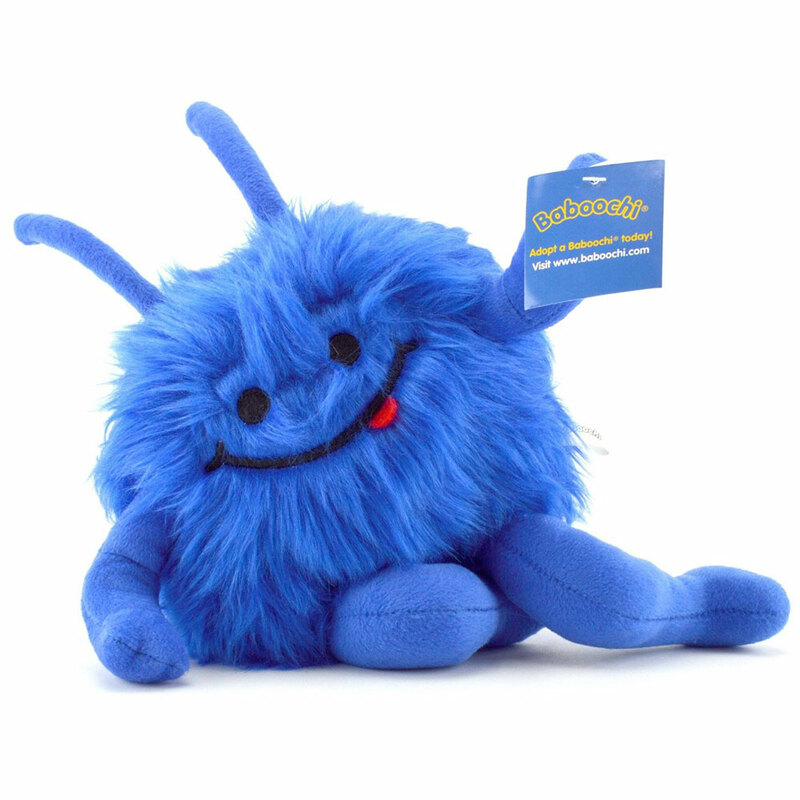 The Baboochi has moveable arms and legs so it’s much more fun to play with than your average stuffed toy. This doll also has quite a bit of heft to it. I was honestly expecting something more like a tiny stuffed bear. I almost don’t even want to call it a stuffed animal.This definitely seems like a toy that will last a long time. There’s a little website you can go to to get a birth certificate for your Baboochi as well. Overall we really love it and I might have to purchase a second one for my daughter. The Baboochi is a hit in this house. The story and plush Baboochi are absolutely adorable. My daughter loved the story about the Baboochi and how they are here on Earth now. In fact, she asked me why we only adopted one. She wants to adopt more, after hearing the story. At the very least, she wants one more so our Baboochi can see it’s fellow Baboochi’s. This story with a paired plush is far different than any other story paired with a plush that I’ve come across. The Baboochi product brought kindness, thoughtfulness, and love to my daughter. she named ours “Love Everyone” based on the story. So, that is the message my six year old received. 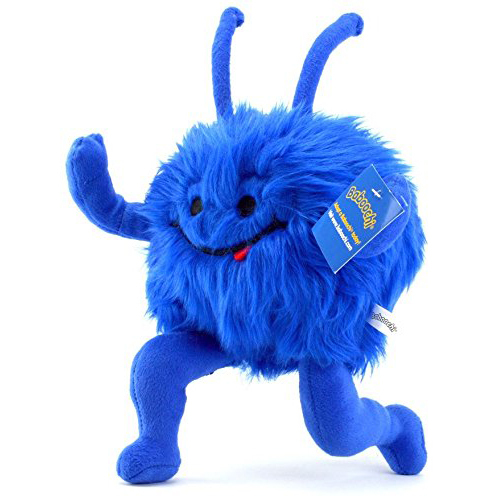 The arms and legs on the Baboochi can be moved, and it is a very cuddly plush. Ours has been introduced to everyone and every stuffed animal in the house. I think the story is great and look forward to more stories. I am on the constant search for new books for my 6 year old twins. We are enjoying our Illustrated Hard Cover Story Book of Baboochi . The set even comes with a plush Baboochi included. The story book is cute and engaging. The kids just love the stuffed toy too. The toy is ver nice , high quality .Happy customer here. My 6 year old loves this story and his very own Baboochi! He also adores saying “Baboochi”!! This is just an adorable story and having his Baboochi with him while he reads it is perfect! He likes how he can pose it with its movable arms & legs. Good lesson taught with a lot of fun too! Plan to purchase for his friends birthdays! This was a surprise for my granddaughter who is 6. She immediately sat down and tore open the box and hugged her new Baboochi. She then proceeded to read the entire book to herself, asking me only a few words. As you see, she brought him over to have dinner with us. She did not want him to leave her side. Later, she read it again to me. I took a video of it. Posted below. So adorable. That cute face and blue hair is endearing! Very well made, high quality, just the right size for her to hug, so soft and cuddly. The legs are bendable. She noticed that and bent them around and said “Look grama, he is kneeling.” She does not have a doll that she can bend like that. The next step is for her to actually fill out the adoption papers and I know she is going to love that. The book is also high quality paper and the hardcover is very thick. It will last a long time. Not like some of the books I buy these days. Because we opened the gift at my place after a while she checked to make sure that she could take it home with her. What I liked was it teaches her humanity and caring about another group of people that she is not familiar with. It shows a peaceful person bullying another and demonstrates that it is harmful but also that a child can remove themselves from the bully. Both Hazel and I are looking forward to the upcoming books that are announced in the end of the book. The Adventures of Baboochi is certain to become a family favorite. I am going to order a few more and give them as gifts to other youngsters. Would even make a nice shower gift. That color and smile is sure to impress even a baby. These little guys are so cute! The book has a nice message with nice illustrations and is easy reading. The stuffy is fluffly, soft and the arms and legs are poseable. Really cute idea for birthday gifts. Love the idea that they can go on line and get adoption papers. I got 3 of them for upcoming parties and the kids all loved them! I bought this for my almost 4 year old son, for his 4th birthday. I had a feeling he might enjoy it. He loves critters, imagination, books, and BLUE. I have been absolutely floored at his response to this little guy. Not only does he just love this little blue Baboochi, but with the story book included, he has a deeper love for the character. He sleeps with him and requests that we read him the book. He feels it is his job to care for and protect his Baboochi. This “toy” is absolutely incredible. With the back story in the book, it really comes to life in the child’s imagination. My son genuinely cares for the safety, happiness, and wellbeing of this little critter. I’m truly in awe of the effect it has created. If you’re considering purchasing a Baboochi, I insist, don’t hesitate, buy it. Your child will be beyond happy. Make sure to read the story! It truly brings the Baboochi to life. Got these for both of my kids and they love playing with them. The legs are bendable and they are soft and cute. Also there is a corresponding book that goes along with the character. My kids are 2.5 and 5 and the toy is really workable for both ages. would also make a cute gift for little girls and boys.